If you’re just joining us, the premise behind The Spamwise Chronicles is an appreciation for the beauty in food and in the world around us, for cooking seasonally and eating well. Seasonality has its challenges, none more readily apparent than during winter, when the abundance that marks the rest of the year vanishes for three long months. It’s not just the ingredients that change, but also the style of cooking. Hearty, rib-sticking soups and stews start to make regular appearances. Long-cooked, braised meats are major players on the culinary stage. It takes a healthy dose of creativity not to burn out on the same kind of meals, day in and day out. I hope that these three recipes give you a few ideas that you can use to spice up your meals during the dead of winter. 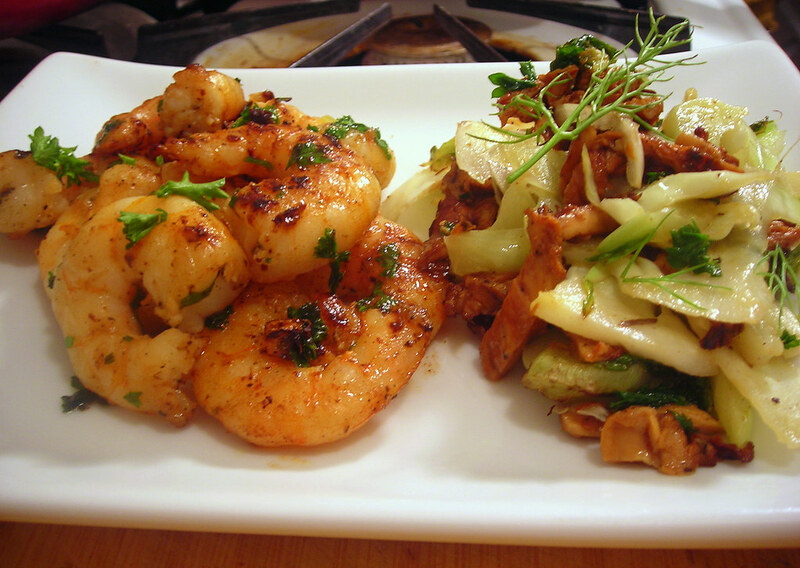 Gambas al ajillo is a popular tapa common in Spain. This dish is now my favorite way to eat shrimp and has a permanent place in my repertoire. Preparation couldn’t be simpler or more straightforward, and best of all, it takes no more than 20 to 30 minutes, including prep time. Place shrimp in a small bowl. Sprinkle with kosher salt and set aside for 10 to 15 minutes. Gently warm olive oil in a large skillet over medium heat. Add garlic and fry until cloves turn a pale gold, about 1 to 2 minutes. Add shrimp to the pan and cook, stirring occasionally, or until shrimp are cooked through, about 3 to 4 minutes. Stir in parsley; toss. Finish with a squeeze of lemon juice. Toss once more, then remove from heat and serve immediately. Time: 20 to 30 minutes, including prep. * You can substitute cauliflower florets if you prefer. Gently warm olive oil in a large skillet over medium heat. Add garlic to the pan and cook until cloves turn a pale gold, about 1 minute. Add chanterelles and a pinch of salt. Sauté the mushrooms until they begin to brown and are tender. Remove from heat and set aside. In the same pan, warm olive oil over medium heat. Add cauliflower leaves and core to the pan along with a pinch of salt. Cook, stirring frequently, or until cauliflower softens, about 20 to 25 minutes. Return chanterelles to the pan and heat through. Remove from heat; taste for salt and pepper and stir in parsley. Finish with a squeeze of lemon. Add fennel and toss to coat. Serve immediately. This is an adaptation from Mario Batali’s “Simple Italian Food“, with a few changes. For example, quantities in the original recipe on page 122 are sized for four servings; I’m cooking for one so I’ve reduced proportions accordingly. Prepare pasta according to package directions. Cook until al dente, then drain and set aside. Reserve 1/4 cup pasta cooking water. Chop the reserved fennel fronds and set aside. In a large skillet, warm olive oil until almost smoking. Add garlic, red pepper flakes and fennel, and cook, stirring frequently until the vegetables are golden brown and quite soft, about 6 to 8 minutes. Add penne to the pan and mix well. If the pasta seems too dry, add reserved pasta cooking water tablespoon by tablespoon or until the desired consistency has been reached. Stir in the mint, parsley and fennel fronds. Taste for salt and pepper, sprinkle each serving with 1 tablespoon toasted breadcrumbs if you wish, then serve at once. The penne dish is my submission for Presto Pasta Nights #245, a weekly foodblog event that will be hosted and organized by Ruth of Once Upon a Feast. 22 Dec	This entry was published on December 22, 2011 at 3:13 am. It’s filed under food, Italian food, vegan, winter and tagged cauliflower, chanterelles, fennel, food photography, salad, shrimp. Bookmark the permalink. Follow any comments here with the RSS feed for this post. The photos are so tempting, I wanted to lick the screen. I guess I’ll just have to settle for making the recipes. 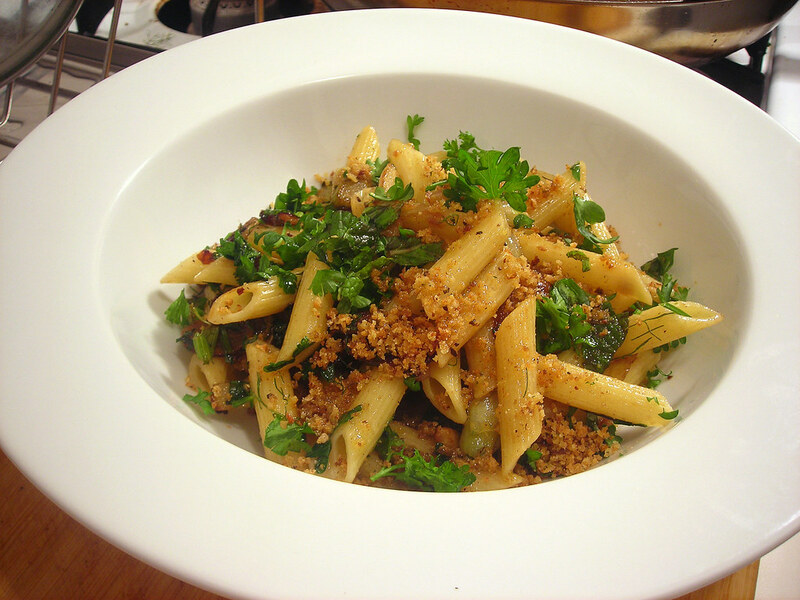 Thanks for sharing the fennel,, mint & breadcrumbs pasta for Presto Pasta Nights.